The Young and the Restless (Y&R) spoilers reveal that the Newmans have even more drama in their future. Things have certainly been wild for this family lately. Victor (Eric Braeden) was attacked by J.T. (Thad Luckinbill), who ultimately shut off life support at the hospital. After a small stroke, Victor reconnected with Nick (Joshua Morrow) as he recovered. Unfortunately, all that progress has been blown. Victor fought for custody of Christian (Jude and Ozzy McGuigen) and won – at least temporarily. Now Nick’s prepared to destroy everything that ever mattered to Victor. He intends to get Christian back and make Victor suffer like never before. Of course, plenty of Young and the Restless fans hate Victor’s guts right now. He knows Nick’s been a loving father to the boy. Victor’s disrupting Christian’s life just to hurt Nick and show off his power. “The Moustache” has always been despicable, but involving an innocent child is really crossing the line. Some soap viewers seem to have trouble separating fiction from reality. As a result, actors often get attacked on social media. 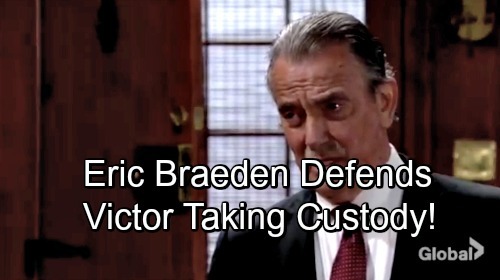 Eric Braeden is the latest Y&R star to face backlash for his character’s actions. However, Braeden stood up for himself and even Victor to some extent. He offered an explanation for Victor’s behavior and promised good things are coming. Although fans don’t usually agree with Victor’s decisions, he’s definitely a big part of the daily chaos. Whenever Victor finds himself near death, loyal viewers always fear Braeden’s leaving the show. There’s a reason the very thought of Victor’s exit causes panic. As Genoa City’s most ruthless character, Victor’s needed for hot plots. There aren’t many GC residents who will take schemes as far as he does. Thankfully, Braeden is staying put and will be featured in some fantastic storylines. With any luck, Nick can prove he’s a worthy adversary. The Young and the Restless spoilers state that Nick will give it his best shot! We’ll give you updates as other Y&R news comes in. Stay tuned to the CBS soap and don’t forget to check CDL often for the latest Young and the Restless spoilers, updates, and news. Just wait! Storylines have to evolve ! It gets damned interesting! I think the Alzheimer &the coma storyline were excellent! Remember, without conflict there’s no drama! This latest conflict between father & son is unfolding into real drama! Just watch! !